I finished my Salmon fly a couple of weeks ago and well, it’s a scruffy old thing but honestly It’s probably one of things I am most proud of. Classic salmon tying is probably about as dramatic as you can get hunched by a vice under the burn of an overhead lamp. I spent over an hour manipulating little shreds of feather making them marry into an acceptable stripey form. It’s an odd thing, when you think about it forcing peacock and turkey bits together to make an attractive marriage. I felt like I was fighting nature as I was doing it. Then oddly began thinking of genetics and eugenics and arranged marriages in Afghanistan and all whilst trying to make a stripey wing. I clearly listen to far too much Radio 4. Anyway, the next stage in the process is to add a weight to your thread so it will pull your feathers down. You can’t see any of this, the feathers are obsured by your fingers which are gripping them for dear life. Two wraps and you drop the weight. Then you sigh and wait. Summoning up the courage to move your hand to reveal perfection. Or a mess. My fly is a bit slovenly housewife rather than yummy mummy. Fishing is all about these agonising little moments. You cast upstream, watch your fly drift, glance at a fish flick it’s fins, will it look? Will it bolt? Or will it gobble. If it gobbles then the agony really begins. Your rod connects and it’s girl versus fish. You feel it shaking its head, sensing every moment of struggle. You look at the rod bending as you feel your tippet strain. You guide it out of weeds, you ease it upwards as it bores downwards. It’s weakening, then a paniced fumble in your pocket for your forceps, or your lanyard is caught in your glasses, then your glasses fall off. Your creel catches in your hair. You screech as the only way out of this mess was to sacrifice a chunk of hair. Then the net then won’t come out of your belt loop. It’s freed with a jerk then the wretched thing gets caught in nettles. You rescue the net, burning your hands in the nettles. The fish flaps as you flail. The heart pounds and the brow wrinkles. Then you calm down, to calm the fish down to ease out the hook. To coo and caress it back to freedom. You sort your line out, dry your fly then do it all over again. Looking at it this way, fly fishing is a bit of a nightmare. 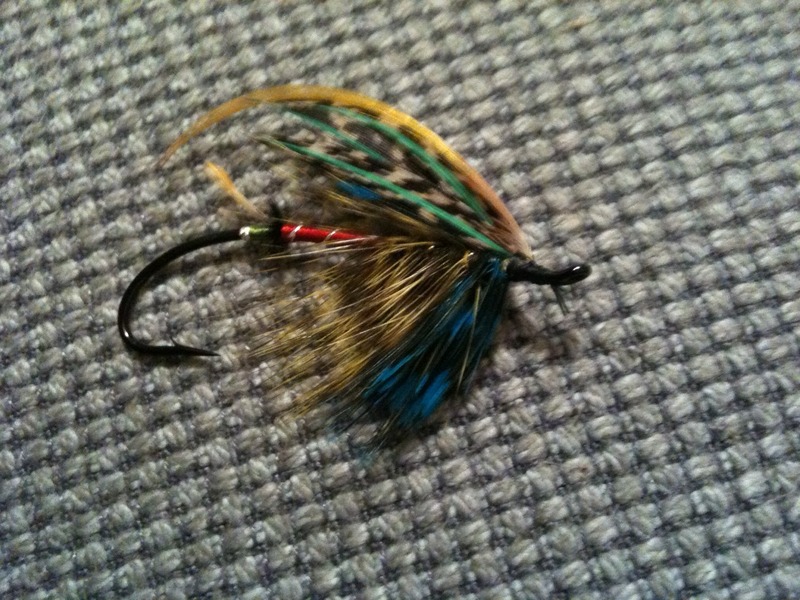 Fly tying more so. Why do we inflict crisis after crisis on ourselves? Or maybe it’s just me that experiences total turbulence each time I catch a fish. Do I do it because of survivor’s euphoria? Or is it because each fish caught, each fly tied is a little victory? A small acheivement that makes sense of and brings a fleeting sense of order to a chaotic world. 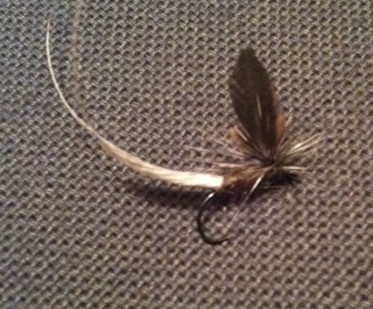 I tied an Ollie Edwards cut wing dun. Shed loads more flies to tie. I am up against it.